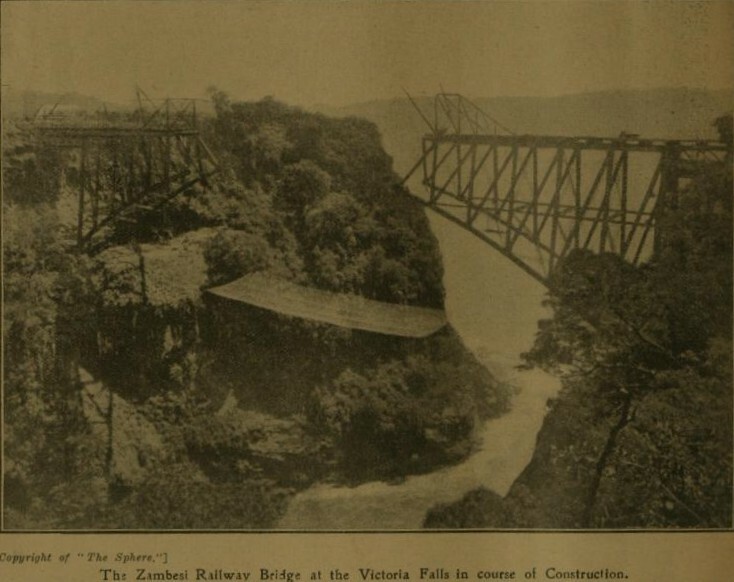 he Victoria Falls Bridge was the inspiration of Cecil Rhodes, who was reported to have said: “build the Bridge across the Zambezi where the trains, as they pass, will catch the spray of the Falls”. This was part of Rhodes’ unfulfilled Cape to Cairo railway scheme, yet sadly, he never even got to visit the falls, and died before construction of the bridge began. Today one of the Victoria Falls Bridge’s main attractions are historical guided tours focusing on the construction of the Bridge, and which include a walking tour under the main deck. On the Zambian side there is a small museum about the Bridge which is free to enter and has a cafe selling refreshments. Also located on the bridge is the Shearwater 111 metre (364 ft) bungee jump including a bungee swing and zip-line. 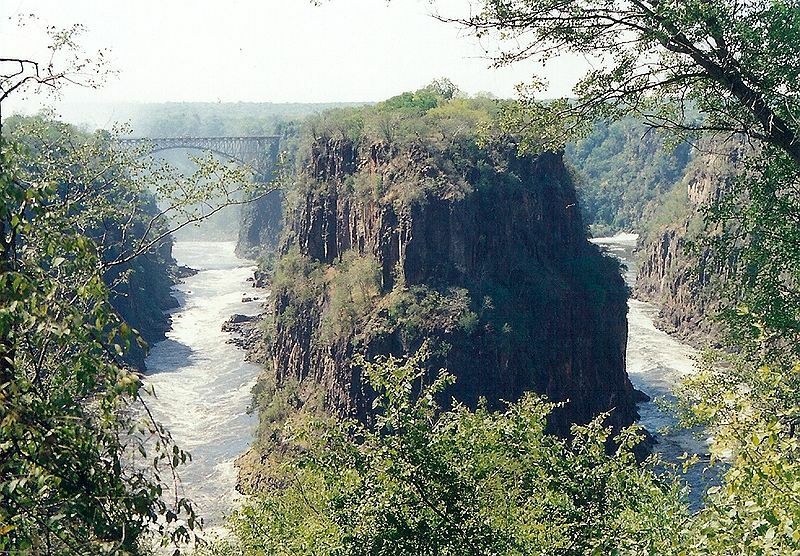 Concerns about safety of the attraction were raised in late 2011 after the bungee’s cord snapped and a young Australian woman survived a fall of 24 metres (79 ft) into the fast-flowing, crocodile-infested Zambezi River below. But hundreds of thousands of jumps have been made now without incident and safety measures have been stepped up. It wouldn’t be a death defying adrenaline adventure if there wasn’t an element of risk! There is also a railway museum in Livingstone, with several old steam trains, and is a good source of information for railway enthusiasts. Constructed from steel, the Bridge is 198 metres (650 ft) long with the main arch spanning 156.50 metres (513.5 ft) at a height of 128 metres (420 ft) above the Zambezi River. It is a road, a railway and a foot-bridge. The Bridge is the only rail link between Zambia and Zimbabwe and one of only three road links between the two countries. Because Rhodes wanted to push on with construction of the Cape to Cairo railway as fast as possible, he insisted that the Livingstone to Kalomo line be laid before the bridge was finished. A locomotive was conveyed in pieces across the gorge by the temporary electronic cableway used for the transportation of the bridge materials. It was nicknamed the ‘Blondin’ by the construction engineers and entered into service on the Zambian side before the bridge was even complete. The railway encouraged the first influx of tourists to the Falls and the original Victoria Falls Hotel was constructed in 1906. For more than 50 years the bridge was the principal route for passengers from Europe and South Africa to the then Northern Rhodesia, now Zambia. Freight trains carried mainly coal into, and copper and timber out of Zambia. Maintenance problems due to the age of the bridge have led to traffic restrictions at times. Trains cross at less than walking pace and trucks were limited to 30 tons, necessitating heavier trucks to make a long diversion via the Kazungula Ferry or Chirundu Bridge. The weight limit was raised after repairs in 2006, but more fundamental rehabilitation, or the construction of a new bridge has been suggested. During the Rhodesian crisis and Bush War the bridge was frequently closed. In 1975, the bridge was the site of unsuccessful peace talks when the parties met in a train carriage poised above the gorge for nine and a half hours. In 1980 freight and road services resumed and have continued without interruption except for maintenance.